North Jersey Families – $30 for $65 worth of organic baby clothing from Fierce Hugs. Shipping not included. Denver South Families – $25 for a 1-year membership to Menu For The Week. 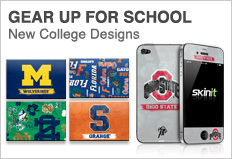 Palm Beaches -$15 for $30 worth of personalized phone or laptop cases or skins from Skinit.com. Shipping not included. Grand Rapids Families – $15 for a 1-year subscription to a Zoobooks magazine. Choose from Zoobooks, Zoobies or Zootles. Includes a poster and stickers. Brooklyn – $68 for an icing teeth-whitening kit from Bling Dental. Shipping is included. Cincinnati – $28 for an 11×14 or $39 for a 16×20 gallery wrap canvas from Image Canvas. Shipping not included.